Las Vegas may conjure up images of flashing lights and tumbling dice, but the city is also surrounded by a vast array of outdoor resources. Southern Nevada is home to some of the best fishing in the state, ranging from tiny urban lakes and ponds to the vast depths of Lake Mead. Fishermen in and around Las Vegas can catch fish species like bass, trout and catfish. The largest reservoir in the United States, Lake Mead spans more than 150,000 acres and sits less than 30 minutes east of Las Vegas. 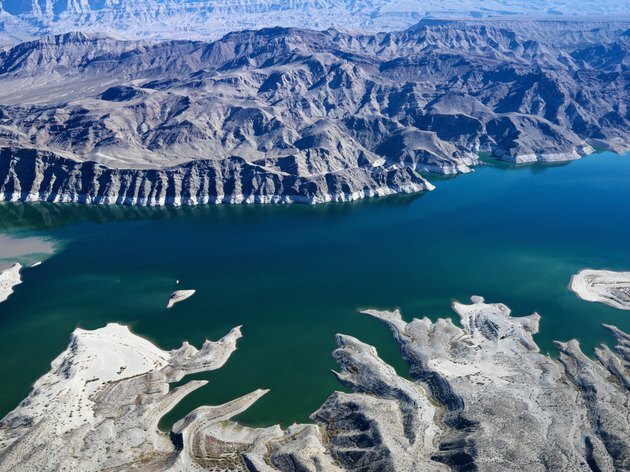 Known for some of the best striped bass fishing in the southwest, Lake Mead also harbors channel catfish, rainbow trout, largemouth and smallmouth bass, crappie and bluegill. The lake offers a diverse fish habitat, with rocky shorelines, steep drop-offs, deep channels and gently-sloping points that hold fish. Dozens of parks, boat ramps and access sites provide places to wet a line or launch a boat along the shoreline. Many of these sites are operated by the National Park Service as part of the 1.5 million-acre Lake Mead National Recreation Area, which also includes numerous campgrounds, hiking trails and other outdoor attractions. Sunset Park Pond, Lorenzi Park Pond and Floyd Lamb Park Pond -- also known as Tule Springs Pond -- are all productive fishing spots within Las Vegas and its various suburbs. Sunset Park Pond is the largest, with 14 acres of water and its entire shoreline open to fishing. In addition to self-sustaining populations of bluegill, black crappie and largemouth bass, the pond is stocked weekly with more than 20,000 rainbow trout from November to March, and with channel catfish from April to October. The other ponds offer similar fishing opportunities, and the parks include ample parking, restrooms and picnic tables. If you're willing to travel a little farther, you can reach several other fishing lakes within three hours of Las Vegas. Lake Mojave is one of the best. Just like Lake Mead, Lake Mojave is a reservoir along the Colorado River, and it supports populations of many of the same fish. You can access this long, narrow reservoir about two hours south of Las Vegas. The Colorado River itself provides plentiful fishing for bass and trout, though fluctuating water levels make the fishing hit-or-miss. Another option is Pahranagat Lake, a warm-water fishery about an hour and a half north of Las Vegas that produces largemouth bass, bullhead, sunfish and crappie. Wherever you decide to go fishing in the Las Vegas area, a current Nevada fishing license is required. You can purchase a license through the Nevada Department of Wildlife website and at most bait and tackle shops across the state. The Department of Wildlife also publishes a free annual fishing guide, which includes all the fishing limits, seasons and other regulations you need to know before you hit the water. The Las Vegas park ponds have a few location-specific regulations to keep in mind, including a daily limit of three fish, regardless of species, and a rule against using live bait.